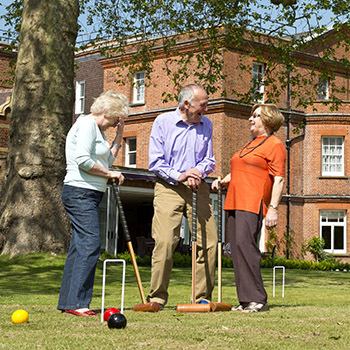 At West Hall care home in West Byfleet, we focus on providing the older people that choose to live with us with an active lifestyle from the outset. You’ll always find plenty to do at West Hall. With a host of leisure activities for you to take part in, our home has a great community feel where people engage with their fellow residents, families and friends, and continue doing all the things they usually enjoy in a supportive environment. Our interests and hobbies are individual to us, they help to paint a picture of the how we like to live our lives and they shape the person we are. At West Hall, we know that the activities people carry out in their free time are often the things that they most look forward to and enjoy. There are several dedicated activity areas at West Hall including an arts and crafts room which has cooking facilities, an impressive library and a garden room. West Hall’s excellent facilities are complemented by a wealth of meaningful activities. 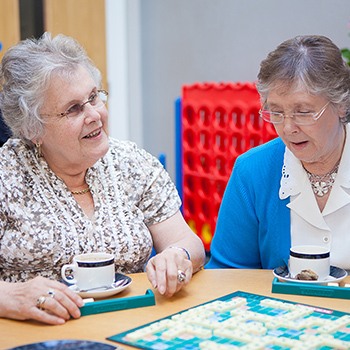 We encourage a variety of hobbies and work in partnership with the National Association for Providers of Activities for Older People () to ensure our range of activities enhance residents’ lifestyle, health and sense of wellbeing. A stimulating events and activities calendar is organised to match all our individual residents’ interests and needs and all activities are highlighted throughout the home. Painting classes, fitness sessions, gardening and movie nights are just a few examples of the type of activities to be enjoyed at West Hall. We also have an iPad which we use with residents regularly. We invite the friends and family of our residents to visit regularly and enjoy our range of daily activities with their loved ones. Our daily activities calendar gives an outline of the type of activities we typically have going on across our home each day. Our home is also very much part of the local community, and we encourage activities that help our residents maintain important bonds with other people and groups around West Byfleet. Many of the most popular activities at West Hall, such as our Tai Chi and Zumba dance classes, are run by instructors from the local area and we are frequently visited by children from the local school. We understand that our residents enjoy getting out and about and have our very own West Hall mini-bus to enable them to enjoy regular outings as well as attend local social activities and groups. Find out more about our links to the local community. At West Hall you are supported to feel fulfilled and as active as you'd like to be.